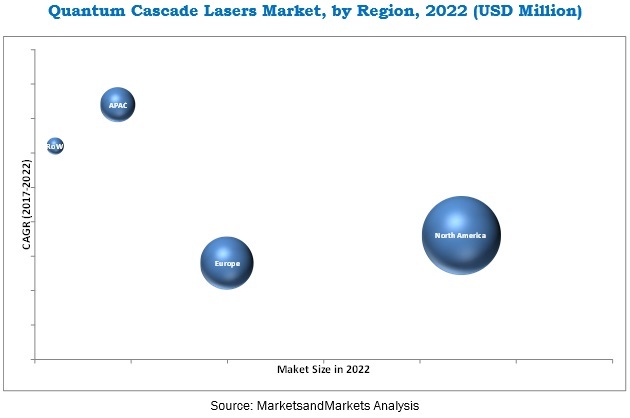 [141 Pages Report] The global quantum cascade laser (QCL) market is expected to grow from USD 302.9 million in 2016 to USD 374.8 million by 2022 at a CAGR of 3.9% between 2017 and 2022. The report aims at estimating the market size and future growth potential of the QCL market based on packaging type, operation mode, fabrication technology, and geographic analysis. The report also aims at providing detailed information regarding the major factors influencing the growth of the QCL market (drivers, restraints, opportunities, and industry-specific challenges) and strategically analyzes micromarkets with respect to the individual growth trends, future prospects, and contributions to the total market. The base year considered for the study is 2016, and the market size forecast is provided for the period between 2017 and 2022. QCL to expect demand from emerging applications apart from conventional gas spectroscopy applications. The quantum cascade lasers (QCLs) have contributed significantly in gas spectroscopy applications. The other applications of QCLs, such as breath analyzers and infrared countermeasures in the military and defense sector, Differential Absorption LIDAR (DIAL), Laser Detection and Ranging (LADAR), are likely to further drive opportunities for the QCL market. The demand for a device that can operate in mid-infrared wavelength at room temperature and having advantages such as compact size, light weight, and low-power consuming diode lasers are driving the growth of the QCL market. The QCL ecosystem comprises software and patent providers such as Block Engineering, Inc. (US), Wavelength Electronics, Inc. (US), Hamamatsu Photonics K.K. (Japan), Thorlabs, Inc. (US), Alpes lasers SA (Switzerland), mirSense (France), AdTech Optics (US), Pranalytica Inc. (US), AKELA Laser Corporation (US), and nanoplus Nanosystems and Technologies GmbH (Germany). Alpes Lasers SA has been selected to supply QCLs for the US Air Force Research Laboratory under Standoff Illuminator for Measuring Absorbance and Reflectance Infrared Light Signatures (SILMARILS) program. SILMARILS is a part of Intelligence Advanced Research Projects Activity (IARPA) by the US Air Force Research Laboratory, Ohio. mirSense announced the launch of the uniMir quantum cascade lasers. uniMir is used for tracking gases such as methane (CH4), ammonia (NH3), carbon dioxide (CO2), formaldehyde (H2CO), nitrogen dioxide (NO2), and others. Wavelength Electronics, Inc. announced the availability of low noise QCL driver for reverse polarity configurations. This device has the lowest current noise density. What are the key packaging types preferred by the end use industry? Which fabrication technology continues to play important role in QCL industry? Which regional & end-user industry markets, QCL manufacturers can explore-in for new source of revenues? Industrial, medical, telecommunication, military and defense, and others are the key application areas of QCL. The industrial sector held the largest market size, followed by healthcare, in 2016. The market for the telecommunications industry is expected to witness the highest growth rate in the QCL market during the forecast period owing to the potential demand for QCLs in free-space communication. HHL and VHL packaged QCLs are expected to grow at the highest CAGR between 2017 and 2022. This growth is mainly attributed to the increasing significance of infrared countermeasures (IRCM) in the military and defense industry. C-Mount Packaged QCLs hold the largest market share due to their low cost. Continuous wave QCLs held the largest share of this market and are expected to grow at a very high rate between 2017 and 2022 due to their deployment in high-power applications in the industrial and military and defense sectors for providing high duty cycles. The market for distributed feedback QCL held the largest share in 2016 owing to its use in gas spectroscopic applications. 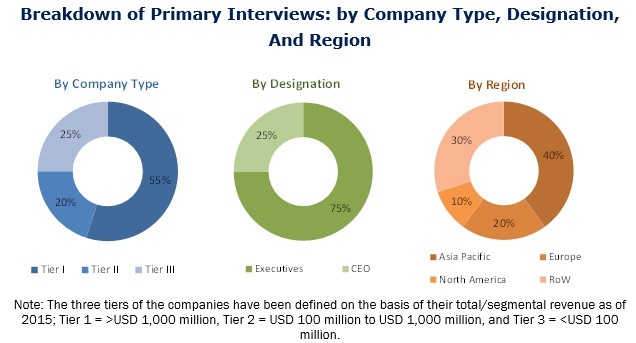 With the increase in demand for QCLs in the military and defense industry, the market for Fabry–Perot QCLs is expected to grow at a high CAGR during the forecast period. North America held the largest share of the QCL market due to the high technological adoption of QCLs in industrial, medical, and military and defense industries in the region. APAC is expected to witness the highest growth rate between 2017 and 2022 due to the presence of industrially developing economies in this region such as China and India. The report analyzes the restraints and challenges faced by the QCL market, such as the high cost of QCL products. Some of the major players in this market are Block Engineering, Inc. (US), Wavelength Electronics, Inc. (US), Hamamatsu Photonics K.K. (Japan), Thorlabs, Inc. (US), Alpes lasers SA (Switzerland), mirSense (France), AdTech Optics (US), Pranalytica Inc. (US), AKELA Laser Corporation (US), and nanoplus Nanosystems and Technologies GmbH (Germany). QCLs expected to be commercialized in the telecommunication industry by early 2019. The most important applications of QCL are gas sensing and measurement. It is very important to detect various gases and measure their concentration in industrial processes to ensure safety. Gases such as carbon monoxide and nitrogen monoxide have their fingerprint absorption features in mid-infrared frequency range. Each of these gases has its unique characteristic wavelength for which can be sensed by the QCLs. The commercial and military aircrafts face a threat of being shot during attacks. High-power QCLs, which are mostly Fabry–Perot type QCLs, are deployed in military applications such as infrared countermeasures (IRCM) for targeting and detecting forbidden substances (e.g., explosives and drugs). DIRCM is a direct infrared countermeasure technique where sensors of missiles that target military or civil planes are deterred by QCL countermeasures. This way missile attacks are avoided by deflecting and confusing IR heat-seeking missiles. This is a very effective way of protecting aircrafts. Thus, the development of IR countermeasure systems is growing quickly. Fabry–Perot are high-power QCLs and thus are mostly used in the military and defense sector as compared with distributed feedback and tunable external cavities. For this purpose, high power, robust, and high-beam quality QCLs are used. The adoption of noninvasive practices in the medical field is increasing day by day. Breath analysis is one such technique where detection and monitoring of diseases related to respiratory track of human beings can be detected. QCLs are being used in the medical applications as a diagnostic tool in breath analysis of the patients. Its detection capabilities lie in the mid-infrared frequency range.